Milo: “The wind is not moving today”. Milo: “No, I’m not smart, I’m a big boy. That’s Milo’s favorite sentence these days and he can’t seem to stress it enough. Notice how he is not only big, but bigger? What he is trying to say is that he is a big boy and trust me, we are holding him up to this statement as often as needed. I think he got it from preschool, where the older class is allowed certain things that the little ones can’t do. In some aspects Milo is really becoming a big boy. He goes to preschool 5 mornings a week and is learning so much. His speech is exploding and now 80% English and in full sentences. He is holding conversations with his friends and they can play totally self sufficiently together. Also, just like a big boy, Milo has a girlfriend. Actually, one in school (her name is Veda. They show each other their lunch boxes if you know what I mean ;-) and a different one in his free time (Lilia). He is definitely into older, dark haired girls. And they love him too. Day 1: Put Milo in underwear or without pants and sit him on the potty every half hour to get him into the routine of going potty and avoid accidents. Successfully even through the Thanksgiving party. We still put on a diaper for his nap and at night. Day 2: Spacing potty visits out to every 1 hour. One accident. Milo had been holding his poop for two days because he doesn’t want to do it in the potty, then it plopped just out on the floor when he was without pants. Day 3: Milo is tarting to say when he needs to go potty, but you gotta be fast because it comes out the same minute. So, we still put him on the potty eery hour. Another poop accident. This time in the pants. Day 4: Discouraged by the poop accidents and the fact that Milo doesn’t seem to be able to hold stuff in, I put a diaper on him in the morning. But he doesn’t want it, so I explained to him how he needs to hold the pee in when he feels it coming and that he can use his hands to hold his junk if needed. He totally got it! (Sometimes I still underestimate this child’s brain growth and tend to give up instead of explaining things. Gotta get rid if that habit. He’s a smartie after all.) From then on we only put Milo on the potty before leaving the house or sleepy time and relied on him to let us know when he needed to go. No accidents! He’s successfully holding everything in until we get to a potty. even when out and about. Day 5: First preschool day without diapers. I deposit 3 extra pants and underwear, but he doesn’t need them. Day 7: After one week with diapers only for sleeping, the nap diaper is now staying dry. So we skip it and only keep the night diaper. Day 30: Night diapers have been dry for two weeks, so we ditch them as well and never looked back. That’s how Milo became completely dry within only a month. Much easier than anticipated. He IS my big boy. This is Milo’s idea of a modern and somewhat functional art installation. Whenever he helps me put clothes away in our closet he asks for a good amount of hangers and makes sure to hang them all the same way on our dresser. Hopefully this is a sign of his sense for organization. Now that Milo has sufficient words to tell us stories all day long, but not quite enough language to always be coherent or precise, there is some pretty funny stuff coming out of his mouth sometimes. It kind of gives you an idea what an almost two-year old’s logic looks like. I will collect those random outbursts of genius and share them here with you. #2: When in Germany Milo started digging the typical Marmeladenbrot or Butterbrot – a slice of bread with butter and or jam spread on it. After we got back home, I was talking to Milo about his brother and asked him what we should name his brother. Milo said “Brot” (=bread). Apparently Bruder / brother sounded similar enough to Butter / butter, so that he immediately connected it with Brot / bread. Remember this post from a while back when Milo’s room got cleared of the baby crib and other nick nacks? Well, of course I didn’t leave it all empty like this. I’m loving me some blank canvas for more home decorations! 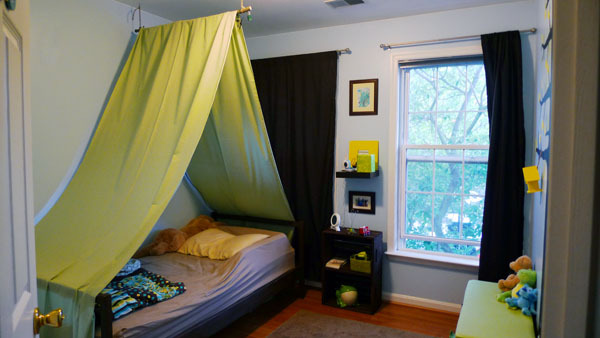 The way Milo’s bedroom theme has been evolving it is now clear that it is all about the outdoors. 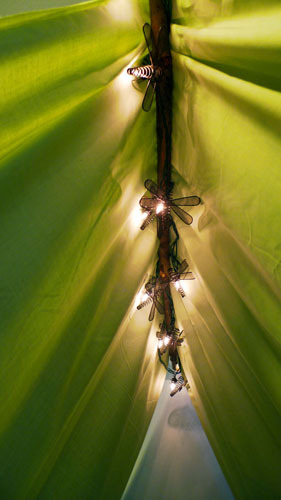 It started with some baby froggy gifts, then came the tree, the tent, and now we are all about camping outdoors. So, here is where we went with some more upgrades to his big boy room. 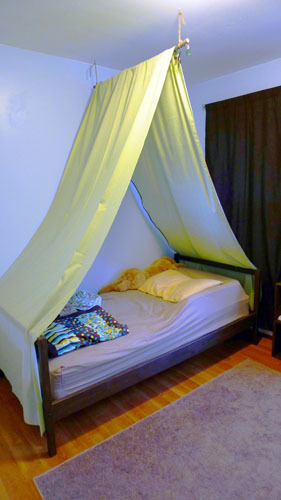 First, we went to IKEA, bought the cheapo Fjellse bed frame for $40, hacked it and stained it. I wanted the thing to have a footboard as well as a headboard for symmetry, plus the headboard didn’t need to be quite that high. So Linc built a footboard out of some 2x2s, shortened the headboard and attached them both to the bed. Then it got stained brown to match Milo’s bench. 1. 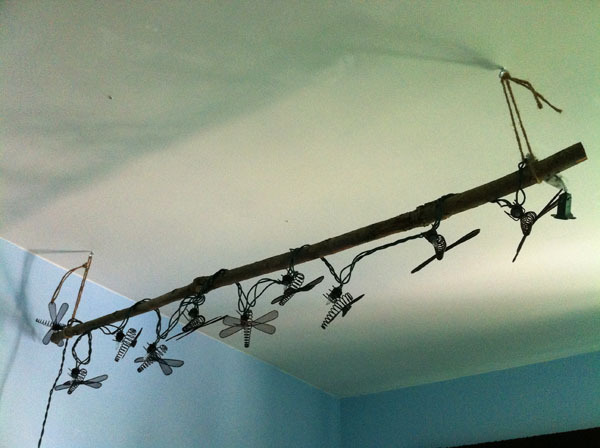 Find a straight branch and attach it to the ceiling with string and loop hooks. 3. Throw a couple of yards of cheap fabric (got these 6 yards for $18 at Joanns, but really only needed 5) over the branch. 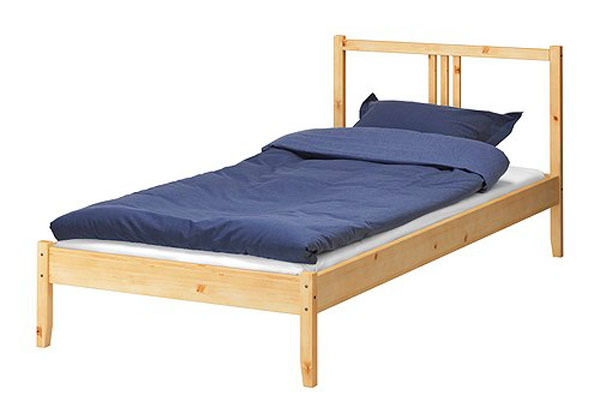 I also ordered some of these bed bumpers (for some reason their price went up quite a bit, I got them for under $20) that are placed under the bedding and prevent any active movers to fall out of bed while they are still learning to sleep like a big boy. Milo loves hanging out under the dragonfly lights in the evening. 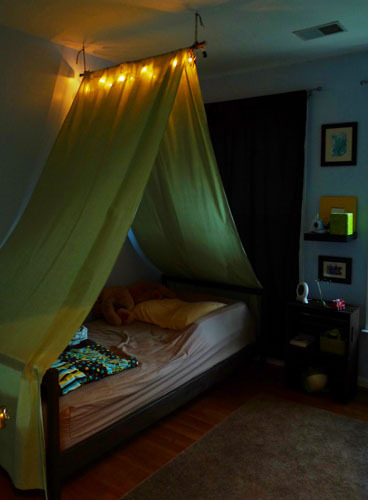 They make for a really cozy atmosphere in his room. 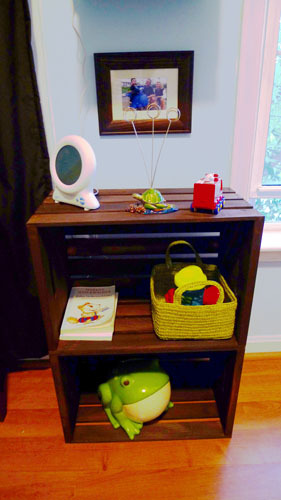 The next step was to build a night stand to go with the new bed that could hold some of Milo’s essentials like his favorite good night books, a drink, his frogs, and his Gro-Clock. This sleep training clock is the best on the market in my opinion and also acts as a night light. See my more detailed review on this purchase here. 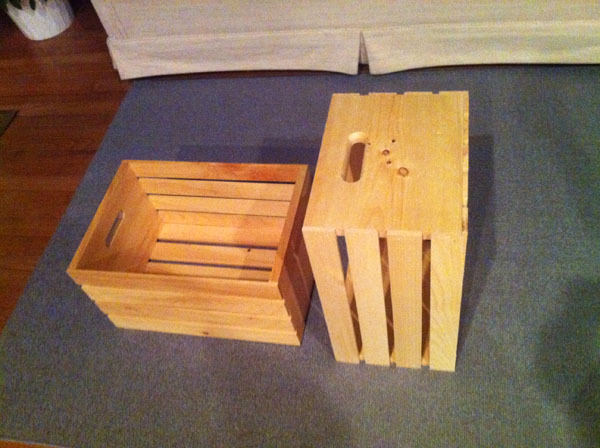 So I got two wooden crates for half price ($15 for both) and stained them the same brown as the bed. Afterwards I just stacked them on top of each other, which is more stable than expected and leaves the opportunity to use them separately again in the future. 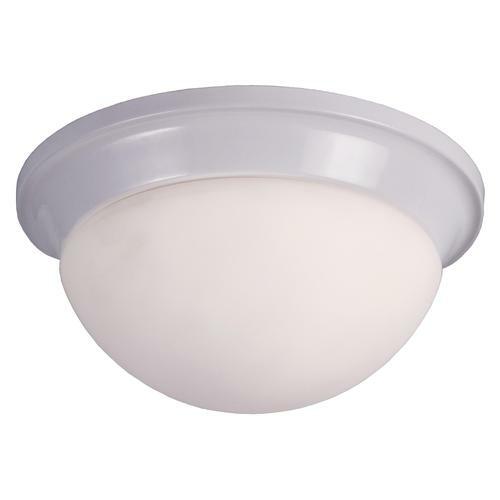 The biggest improvement, however, is almost invisible in all the pictures, yet makes such a big difference to the room: Milo finally has a real ceiling light. One that turns on when you hit the switch at the door. Nothing special you might think, but somehow the previous homeowners had never installed it. 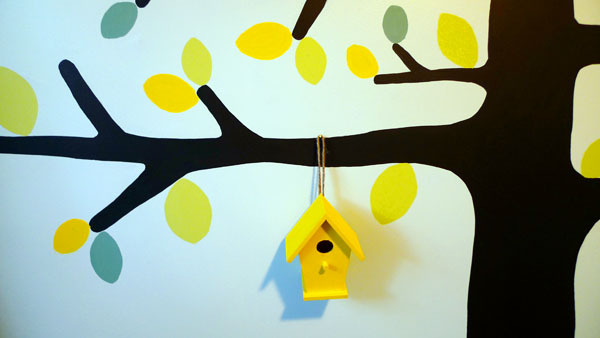 Instead in both kid’s rooms (as well as the master and the living room) the light switch controls a wall outlet. 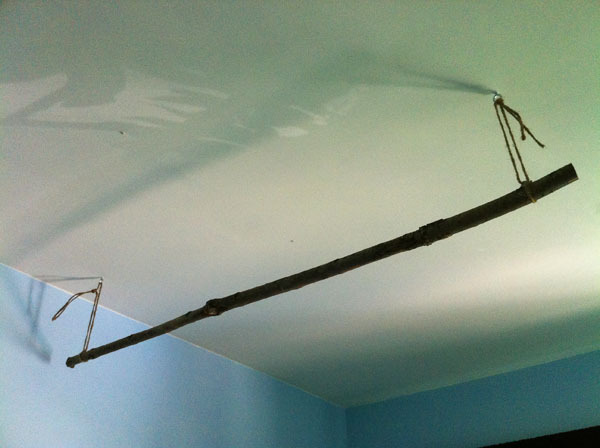 But since we are not a big fan of having floor lamps standing around and they really aren’t an option in kid’s rooms where the plug can be pulled and the whole thing can topple over, we have been sort of living in the dark for a bit. Yeah, it does not look crazy cool, but it was free, and it makes light. Which is really a big help in reading books and getting the boy ready for bed. It is not said and done that I might not upgrade it to a DIYed lamp shade at some point in the future, but right now we are all happy with the way Milo’s room works and how it offers him a cozy comfort zone. Believe it or not, the other day Milo went up to his room and put himself down for a nap all by himself.